With over 30 years of combined compounding pharmaceutical experience, they provide you, the patient, and the physician, the most complete source for all your customized pharmacy needs. We invite you to meet our pharmacists and read more about them through their CVs. We all look forward to working with you to assist in providing customized formulas for better living. 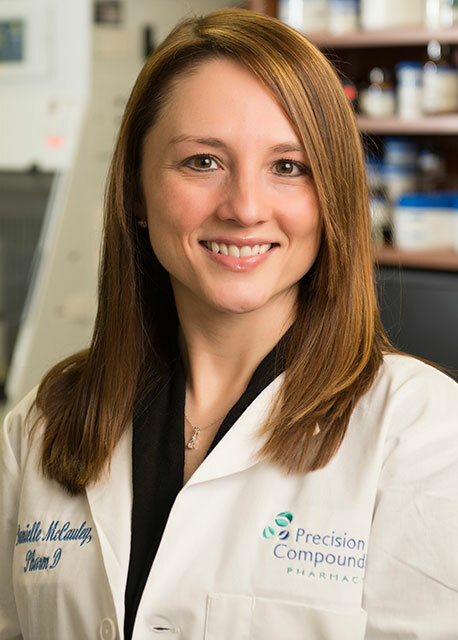 Danielle McCauley, PharmD and Staff Pharmacist at Precision Compounding, graduated from Butler University in 2007 where she earned her Doctorate of Pharmacy. 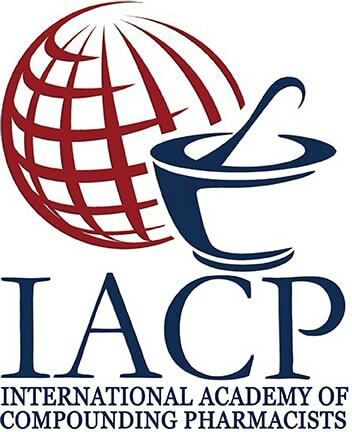 In 2014, Danielle completed a comprehensive compounding course through PCCA. Danielle grew up in New Salisbury, Indiana and graduated from North Harrison High School. Danielle enjoys traveling and exploring the culinary world with her husband and friends. She also enjoys reading, personal development and watching a good movie in her spare time. At Precision Compounding, Danielle processes prescriptions and consults with patients. She specializes in quality control, and feels that working closely with compounding technicians allows her to ensure the highest quality product is dispensed to customers. 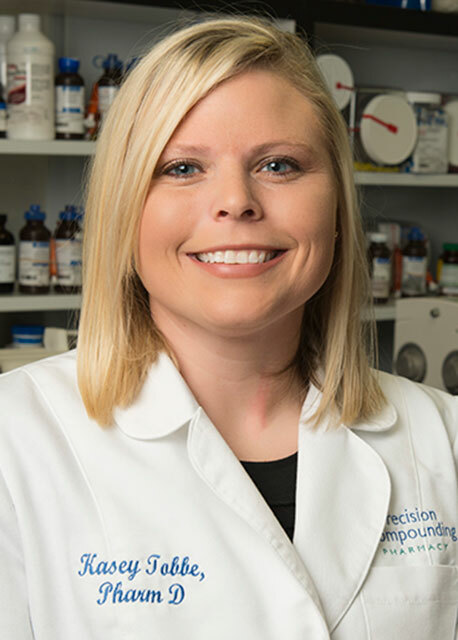 Kasey Tobbe, Staff Pharmacist at Precision Compounding, graduated from Butler University where she earned her Doctorate of Pharmacy in 2009. Kasey has lived in Louisville her entire life and attended Fern Creek High School. She enjoys cooking, traveling, and improving her fitness and health. She is also involved in the community. She cooks meals for the RMH in Indianapolis. She is a leader for the Indiana Chapter Kappa Psi Pharmaceutical Fraternity, Inc., which is an organization that participates in numerous professional and service events. 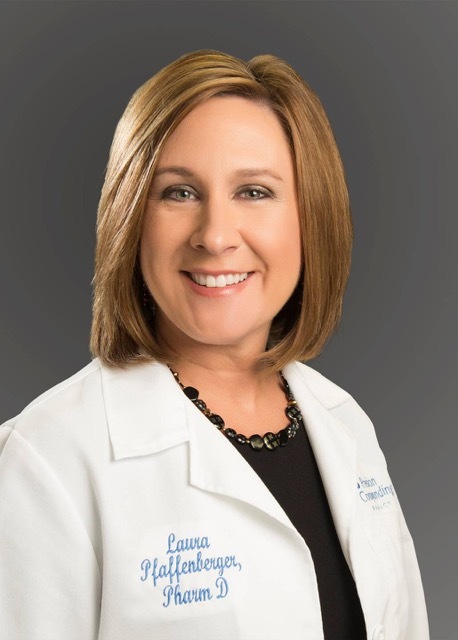 At Precision Compounding, Kasey provides excellent customer service to both patients and other medical professionals. She verifies prescriptions and final products and makes sure all patients receive counseling on how to properly use their medications. Her areas of expertise include compounding and nutritional supplements. 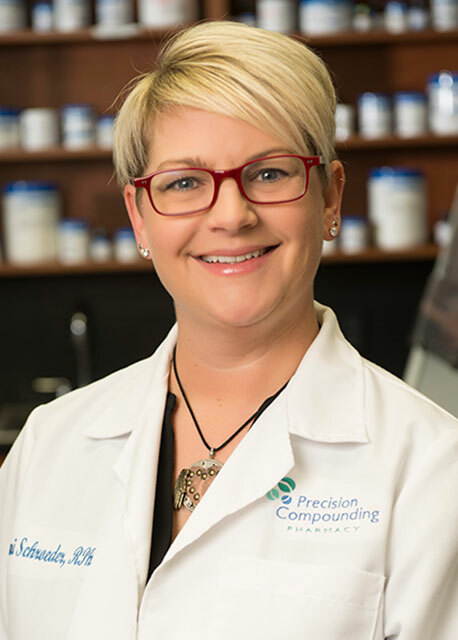 Jenni Schroeder, Pharmacist Staff at Precision Compounding, graduated from Purdue University in 2000 where she earned her Bachelor of Science in Pharmacy. 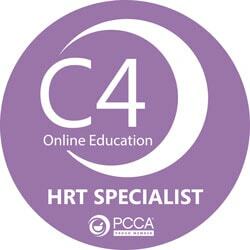 She continues her education through hormone replacement therapy training seminars. Jenni grew up in Marengo, Indiana, attending high school at North Harrison. She currently lives with her husband and daughter in Corydon, Indiana. She enjoys spending time with her family, traveling and boating on the Ohio River. In addition, she enjoys yoga, meditation and learning about health and wellness. At Precision Compounding, Jenni’s roles include counseling and talking to patients and processing prescriptions. Jenni’s areas of expertise include bio-identical hormone replacement consultation, and she enjoys helping women feel better.